This newly-released picture of Pluto isn’t quite what our eyes would perceive… but then our eyes aren’t high-tech scientific imaging sensors like the ones aboard New Horizons! An enhanced-color image made from data acquired by the spacecraft’s LORRI and Ralph cameras on July 13, 2015, this view of Pluto shows the many variations in surface compositions across the planet’s visible area. What the compositions are specifically and how they got to be in the places they’re in are questions still being worked on by scientists, so for now we can all just have fun speculating and enjoy the view! New Horizons scientists use enhanced color images to detect differences in the composition and texture of Pluto’s surface. When close-up images are combined with color data from the Ralph instrument, it paints a new and surprising portrait of the dwarf planet. The “heart of the heart,” Sputnik Planum, is suggestive of a source region of ices. The two bluish-white “lobes” that extend to the southwest and northeast of the “heart” may represent exotic ices being transported away from Sputnik Planum. Four images from New Horizons’ Long Range Reconnaissance Imager (LORRI) were combined with color data from the Ralph instrument to create this enhanced color global view. The images, taken when the spacecraft was 280,000 miles (450,000 kilometers) away, show features as small as 1.4 miles (2.2 kilometers). See more news from the New Horizons mission here. Reblogged this on Science and Society. 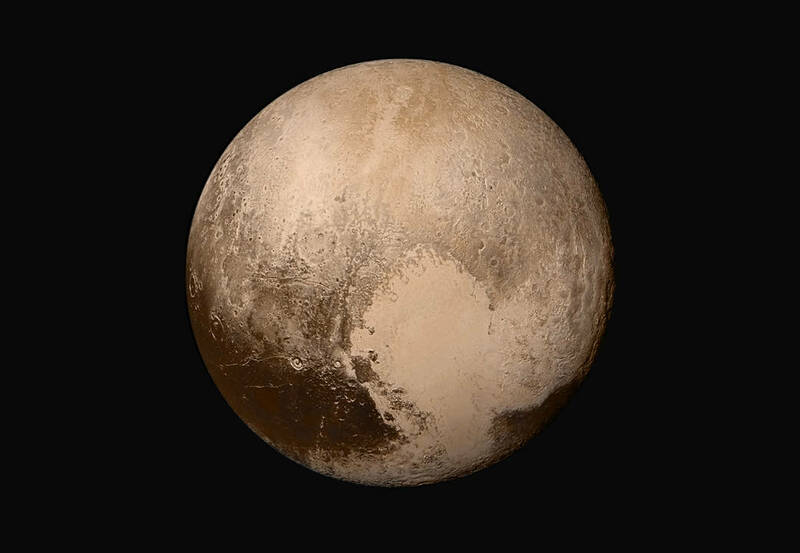 so pleased that Pluto surpassed expectations, instead of being named for the God of the Underworld it was more like it was named for the ‘God of the Underdog. Hey! I have created a new blog that features my interest of Outer Space and its secrets. Check it out! Also, love your blog!!! !